With the new Pinnacle building, Gym and Learn has grown to the next level of the program. 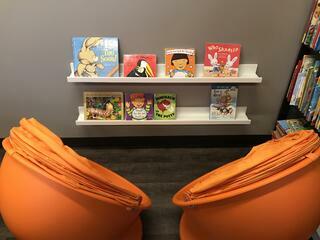 We are excited to have our own bright and colorful classroom with dedicated center spaces, new and more open schedule, and our child sized bathrooms. Library: Two students are welcome to sit in our unique, cozy chairs and curl up with a good book. The library center allows students to explore books based on the weekly themes and enjoy learning at their own pace. Sensory Table: Our bright red table allows students to enjoy everything from counting and sorting beans to playing in water and shaving cream. Dramatic Play: The kitchen area is quickly becoming a popular center in our classroom. 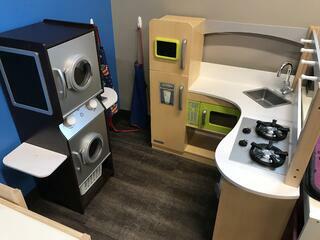 This area includes a large, L shaped kitchen set, washer and dryer, and table for students to pretend with their classmates. Building: Four children are welcome to enjoy the building area at a time. Students can build using various materials; including Duplos, Magnetiles, blocks, and so much more. Fine Motor: On one of our large tables, students are able to play pretend using various toys including Mr. Potato Head, play animals, houses and more. Art Table: The other large table is used for our art. At this table, you can find either open art options such as coloring, play-doh, glue and scissors or structured, teacher led art time where students are completing a different art project each day. Educational Zone: On the two fold out tables, students complete activities that pertain to the letter, number, or theme of the week. Students can participate on their own, or with a teacher to help focus and enhance their skills. With the new space, Gym and Learn is able to adapt our schedule to better suit our classroom schedule. We are now able to divide the classroom into various groups based on age, ability, or simply by friendships. With the better defined space, the teachers are often found sitting with the students in the various centers, allowing for more one on one interaction time. Gym and Learn is now also offering additional enrollment spaces on both Monday and Wednesday mornings. We have added an additional teacher and are able to divide the classroom into three groups. At any given time, one group is found in the gym while the other two groups are in the classroom, learning from both direct and indirect instruction. The small groups can also be found in the party room or other spaces throughout the building learning through gross motor and academic games geared towards their group. One of the last, but best surprises of the new classroom is our child size bathroom and sink. This allows our students to learn independence and prepare them to graduate to Kindergarten. 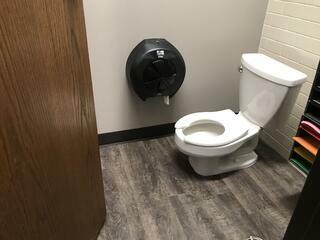 The bathroom also allows for the teachers to spend less time monitoring the students to the bathroom and more time teaching in the classroom. Plus, it is simply adorable! The Gym and Learn program continues to grow and expand each and every year. With the program graduating 12 students to Kindergarten this year, it has developed in to program that continues to develop strong, independent, and smart students throughout their preschool years. We are excited to continue to see what the next steps are and would love for you to be a part of it. Interested in learning more about Gym and Learn for the upcoming sessions?